After Months of practice you made it to the final round of the Atari Wrestling Federation Championships. Now you stand gloriously in the ring, sure to make enough dough from this title bout to retire to a farm in Vermont. If you can survive. The announcer, a little man with a voice like a muffler on a halfdead pickup truck, reaches for the overhead microphone. He announces the name of the champion, a 394-pound mountain who hasn't lost a match since Troy was sacked. The crowd roars. Then, between giggles and snickers, the announcer spits out your name. Your fan cheers as the undertaker edges his way toward your corner and pulls out his measuring tape. But you know you can do it. After all, you've made a science of the Flying Body Press. So what if your opponent outweighs you by 286 pounds. The opening bell clangs as the bout begins. The champion lumbers toward you like a freight train gone berserk. This is not going to be easy. Do you have the guts and the skill to defeat the mad man of mats? Will you retire to that farm or spend the rest of your life in intensive care at the local hospital? It's too late to back out now, so give it your best shot. Good luck! You'll need it. 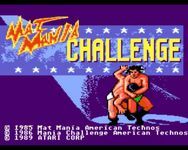 Mat Mania Challenge simulates a series of wrestling matches between either two players or one player and the computer. The object of the match is to either pin your opponent for a count of three, keep him out of the ring for a twenty count, or outscore him. Each match lasts three minutes. Your point accumulate throughout the match. If neither wrestler is pinned for the count by the end of the match, the player with the highest number of points wins. Two-player games consist of up to three matches. If one player is pinned, the game ends and the title screen appears. If no one is pinned by the end of the third match, the player with the highest score wins. In a one-player game, if you pin or outscore the computer opponent, you will move on to the next match. If the computer wins, the game ends and the title screen appears.